Looking across the river to America, land of the ice? "Blast. There's too much ice. I can't see a thing." She just wouldn't heed the warnings. Look at the ice chunk that fell on her head! She's lucky she didn't get hurt from that thing! Hey guys! My friend Chris of savethedoodle.com was inspired by this entry to create a masterpiece that pretty much sums up the situation we find ourselves in right now. It is pretty awesome...and spot on! Check out Chris' doodle here. Well, barring a major and unexpected turn of events, the Recovery and Reinvestment Act of 2009 (here's a great site with the breakdown of where the money is going) will be signed into law sometime early this week by President Obama. 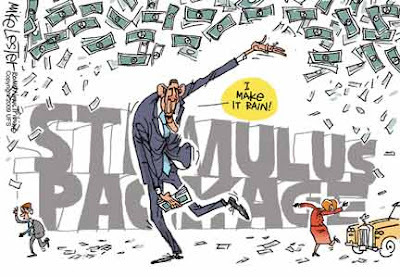 Unfortunately, the reality of the stimulus package is that while it it might bring some short-term relief to the state of our economy, the long-term ramifications of something this enormous and so hastily thrown together (read: a liberal wish list of things they want while they know they can get the money) are indeed frightening. What has upset me the most, along with many other Americans I would imagine, is that the president paraded around the country scaring us all into thinking that we had no other choice. He got onto primetime TV and said that another depression was imminent if we chose to do nothing. But here's the deal. I wasn't alive in the 1930's, but we do have data and facts from that time period that allow us a glimpse into the reality of what a depression really was like. And folks, let's just say that we're nowhere near a depression. Not by a long shot. The job losses were fewer in the 1981-1982 recession, but the work force was smaller than it is today. Thus the reason for the same percentage. Call me crazy, but last month's 7.6% doesn't even compare to 1982's numbers, let alone the numbers in 1932 during the height of the Great Depression. 2008: The GDP actually rose last year (despite a really bad 4th quarter); however, the Congressional Budget Office predicts a decline of 2% in 2009. Once again, it is obvious that the numbers from today are comparable to the 1981-1982 recession, but they are nowhere close to what they were during the Great Depression. 24 compared to 3,000 or 10,000. Seriously?? It is clear from these numbers that, while the current recession is bad - and there's no denying that there are people who are hurting from the downturn - there just is no comparsion to the Great Depression. If anything, the recession of 1981-1982 is more of a bellwether to the current recession than anything else, ESPECIALLY the Great Depression. What Obama is doing is fearmongering. He and the media that worship and adore him have been able to scare hard-working Americans into a panicked frenzy. By using comparisons of our current struggle to the Great Depression, Obama has not only thrown historical accuracy out the window, he has created a political bombshell that is disguised as a necessary component to our economic recovery. Without it, he says, America may never recover. It may sound good and noble to those that think that Obama can do no wrong, but the truth is that this "recovery" will be paid for dearly by our kids and grandkids. I sure hope Nancy Pelosi is enjoying her time in Rome. I get a little more sick every time I think about the "spendulus" package that could be signed into law in mere days. However, I have not lost hope that there are some out there -- even Democrats -- who will stand up against this dangerously foolish package. Case in point: Rep. Walt Minnick, a freshman Democrat Congressman from Idaho, has proposed an alternate and very reasonable plan to what is currently being sold to us as "necessary for the survival of our country". He is a member of the Blue Dog Coalition, which is a group of moderate and occasionally conservative Democrats. Basically, he is proposing a plan called START (The Strategic Targeted American Recovery and Transition Act). 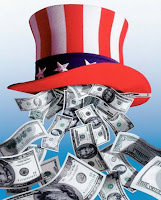 The plan calls for a "bare bones" pure stimulus deal of $170 billion that will put $100 billion immediately into the pockets of low to middle income Americans and then use the remaining $70 billion for basic infrastructure projects that create jobs. The best part? START would require any funds that go unused by 2010 be returned to the treasury. Quite a difference from the current plan, which says that once enacted, it cannot be undone. That's downright scary considering that there is no guarantee that it will even work. Why have I not lost hope? Because this plan was proposed by a Democrat. Minnick was one of eleven House Democrats who voted against Obama & Pelosi's stimulus. We really only need either a couple Dems to vote no, or get the 3 rogue Republicans (including PA's own Senator Specter) who sided with the Dems to switch back. I think it's possible, considering that there are Democrats who don't support the plan....not to mention that public support for the stimulus package is collapsing. We have got to find an alternative way to get the economy moving again...and I know that we can AND MUST do it without burdening future generations with the $1 trillion in debt that this stimulus package will place on their shoulders. Read the stimulus bill here. Find out what you, your kids, your grandkids, and your great-grandkids will be paying for. Contact Idaho Rep. Walt Minnick and voice your support for his alternative plan at (202) 225-6611 or email. DO NOT GIVE UP. This fight is not over. Keep fighting for America! We can do this! Don't let anyone convince you that this fight is over. If this fight was over, President Obama would not be traversing the country trying to tell us ordinary Americans that this is the right thing to do. They are scared. They know that they can still be defeated. And by God, I hope they are. Derek posted this funny Ellen video last night on Twitter (and was quick to point out that he, by no means, watched her show). I laughed so hard that I had to post it here. I love Ellen...and I'm proud enough and man enough to admit it. She makes me laugh like nobody else on TV can. If that makes me less of a man, then so be it. 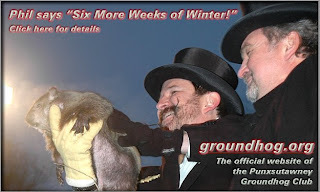 In recent years, Groundhog Day has become much more than a holiday celebrating the birth of Punxsutawney Phil. It has become an event that has given this nation yet one more reason to party and drink. Did you know that there are AT LEAST 40 groundhogs that supposedly offer their prognostication for the remaining days of winter? Rodents like Holland Huckleberry from Holland, Ohio. Or Connecticut Chuckles from Manchester, Connecticut. Or how about the ever-cutesy Pierre C. Shadeaux from New Iberia, Louisiana. As far as I am concerned, any groundhog NOT named Punxsutawney Phil is NOT QUALIFIED to predict whether or not winter is or is not going to continue for six more weeks. The sooner that we the people understand this, the better off we'll be. I honestly can't believe that Groundhog Day has come to this. It is high time that we get back to the true meaning of Groundhog Day and recognize that there is but one, and only one, Punxsutawney Phil.